This traditional English appetizer starts with a hard-boiled egg wrapped in sausage. We give our scotch eggs a slight variation on the original by wrapping them in housemade pork ground sausage and frying them until they're perfectly cooked. Topped off with fresh red peppers, avocado, and a sprinkling of dill, we serve ours upon a "nest" of shoestring potatoes and grains. Enjoy them with a final drizzle of dijon mustard sauce. 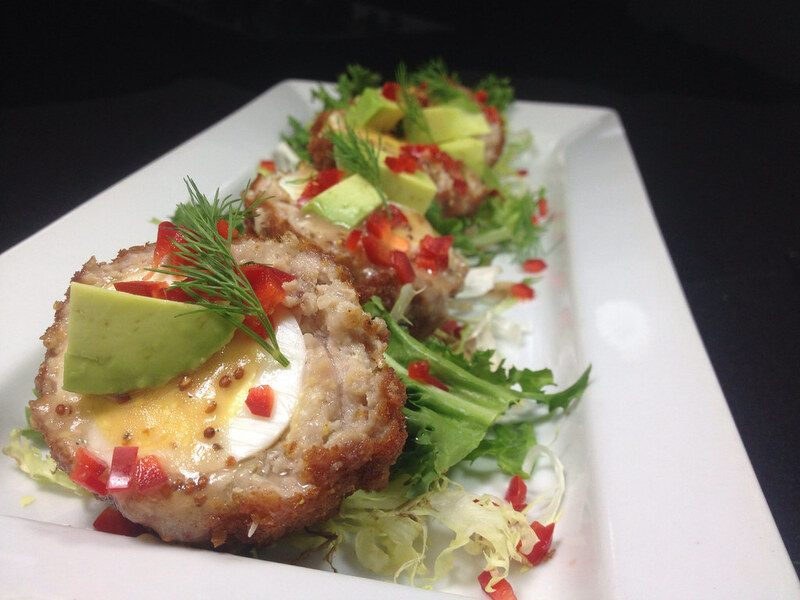 Scotch eggs date back to 1738, but they are still a fan-favorite in England. Originally made in a department store, the intent was to provide a full meal in one tightly made ball that was easy to carry, store, and prepare on the fly. These days, they're typically served up in smaller portions as a snack rather than a full meal. Either way you choose to enjoy them, there's a reason scotch eggs have been able to stand the test of time. Give ours a try today!